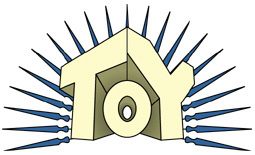 The ToY Awards started back in 1998, when yo was just doing reviews on his own. Yes, there were other end-of-year awards around at the time, but most of them focussed primarily on "child safe" toys, handing out praise for educational content, safety in manufacturing, and encouraging non-violent play patterns. He wanted to honor the toys that older toy fans actually liked. ToyFare magazine had (and still has) a similar year-ender, but when he started, they were nothing but whores to Star Wars. Then they went out of their way to ignore McFarlane. Plus, they had a tendency to include toys to which they as a news outlet had access, but normal collectors did not; things that they had received as samples, but weren't due on the shelf for a few months (they continue this practice to this day). Thus, the ToYs were born. The ToYs are the voice of the real fan community, covering what's really the best of the best. What started out as one "best of" award has grown and expanded to include a few more categories, but still: they're all the best of the best. We've even inspired a few imitators, but when you want the real toy of the year, you head for the Toy of the Year. He came out at the beginning of the year, and fought off every commpetitor who came near. He's huge, he looks great and he's fun to play with. Yes, his price tag was high, but Prime is definitely a toy that was worth it. Other nominees included Trenchcoat Hellboy, for its great blend of sculpt, articulation and materials • Deadpool, because the sculpt is great, the articulation all works and the accessories are killer • Robocop, for his sculpt and the fact that McFarlane gave him all the articulation he needed • and Vintage Darth Vader for the price, the detailed sculpt, the paint and the cloth cape. Excellent sculpt, great paint apps, the perfect amount of articulation and great accessories. The packaging looks like the old game consoles, the character selection is all over the place and despite some early distribution problems, the figures kept coming, so fans would have a chance to get them. Other nominees included Marvel Legends 6 for a mix of great characters, all with great sculpts and paint • Invader Zim, for giant bases, cool accessories and a great sculpt of impossible drawings • Hellboy, for the perfect blend of sculpt and articulation • Spawn 26, because... wait, is that a joke, Spawn 26? • Star Wars for character selection and better sculpts/articulation than ever • NECA's 18" line for good sculpts, thorough articulation and plenty of accessories. One-time-only honorable mention for Fightin' Gear TMNT, because the armor's all removable and interchangeable, the bodies beneath are the most articulated Turtles ever and the price is low, low, low! It's big, it's detailed and it's generic enough that you could use it with any figure you own. Plus, as the true test of any great accessory, people were buying the toy just to get it. Other nominees included Hellboy's articulated Samaritan • Automaster Ryan's bike-building armor • the giant piggy floating behind Gir • Ghost Rider's flaming bike • and Hawkeye's Antman arrow. Other nominees were Shrek 2, for the little ears on top of the cards • the animated Clone Wars for using the Clone Trooper's helmet to define the curved edge of the card • DC Direct's Teen Titans for being space-saving and using the included base as the logo • and Takara's Microman, which used the "O" logo as the basic shape of their reclosable packaging. Because there are two lines of toys that comprise werewolves, vampires and Kate Beckinsale, and even Underworld was better than this. In anyone else's hands, this line could have been big, but Jakks just blew it, big time. You can still find VanHelsing in stores everywhere, not even moving with a deep discount. Other nominees included Minimate Bullseye for managing to screw up a simple black costume • Omega Supreme for being so all-around horrible and crushingly expensive • the C3 Batcave because it falls apart so easily • and Baxter Stockman for being a crime against humanity. Two special "Lifetime Achievement" award nominations, too: McFarlane Toys, because every single Spawn line they gave us this year was the exact same thing - Classic Covers, unarticulated; and Mattel, for the casepacks that killed He-Man, crippled Batman and left the Justice League hanging on shelves. Now that you know what's won this year, you can head on over to see our past winners. The Class of 2004 has joined some illustrious ranks, and they're all archived here.